I like to have everything chopped and prepped and ready to go before I begin because the cooking process goes pretty fast. 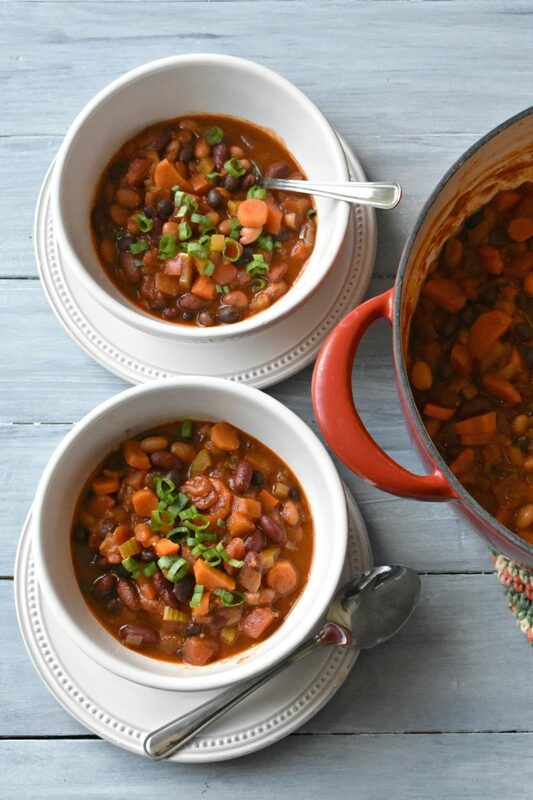 I use three types of beans in this chili because I like the variation in color, but you can use what you have on hand, but I think 3 cans of beans is perfect. 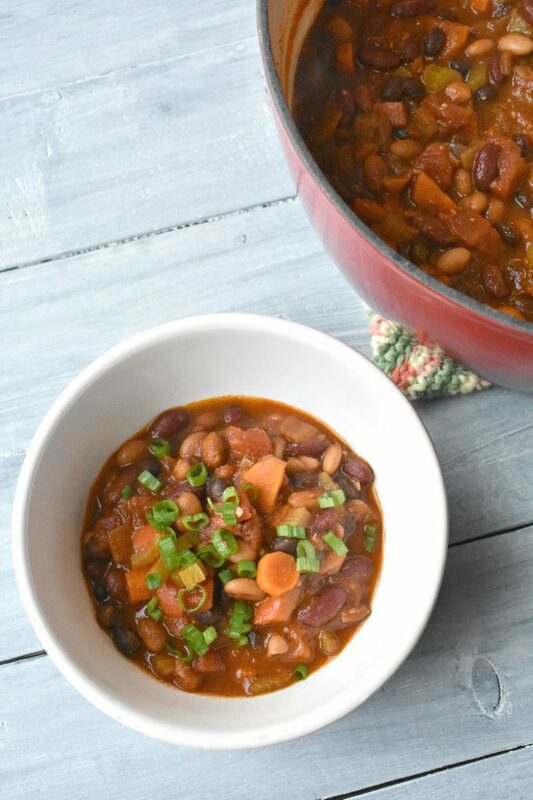 You could do two cans of kidney beans and one can of pinto, or mix it up however you would like. I love this enameled cast iron dutch oven (it’s the same on in these pictures) and use it ALL the time. In fact, I love it so much that I bought another one in a different color! I don’t think I’ll need two because they last forever, but I couldn’t say no. Add carrots, celery, bell pepper and jalapeño, sprinkle with some salt and sauté an addition 5-7 minutes. Stir in tomatoes, tomato paste, vegetable broth and seasonings. Simmer, uncovered, for 15-20 minutes, or until thickened. Taste and add additional salt or pepper, if desired. 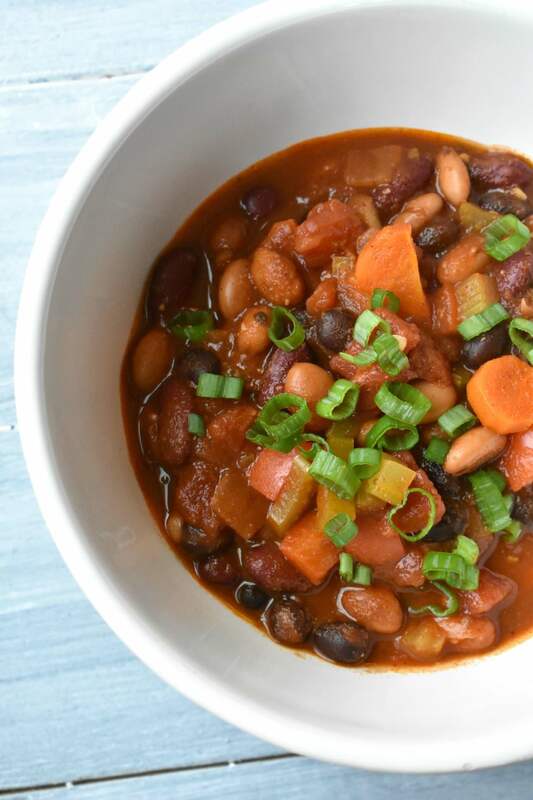 Because of the different sodium content in broths and beans and personal preference, you may need a little more and you may not.